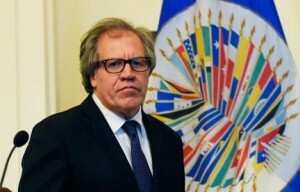 WASHINGTON - The secretary general of the Organization of American States (OAS), Luis Almagro, on Friday urged the government of Venezuela to halt the use of violence and other tools of repression against opposition demonstrators who are peacefully protesting in defense of democracy and the rule of law in the country. One demonstrator killed and dozens wounded and detained is the initial tally from the repression yesterday, which seeks to quiet the clamor for free elections, the only way out for a country devastated by political crisis and looting. The protests on Thursday led to more people injured and detained, "in a completely arbitrary and indiscriminate fashion, as another show of authoritarianism," as well as the killing of 19-year-old Jairo Ortiz. "This crime must call for democracy in the country, for justice, and for overcoming the shame of the cowardice of his murderers," said the secretary general. Almagro also made reference to the responsibility of the military at this time. "This is an authoritarianism that hides behind the armed forces that, far from acting as the forces of order, act as the forces of repression and terror. It is an authoritarianism that, in its escalation of hatred and shame, also infects the armed forces with hatred and shame. This self-described civic-military regime is responsible not only for the loss of democracy and for the critical food situation in Venezuela, it is also responsible for inciting hatred through repression," he said. "Peaceful protest and the right to freedom of peaceful assembly are universal rights that any government, especially democratic governments, must respect," he said, adding: "This again reveals that there is no rule of law in Venezuela and that human rights are methodically violated." In his most recent report to the Permanent Council on the situation in Venezuela, the secretary general revealed the systematic repression and criminalization of opposition voices and civil society groups, as well as the arbitrary detention and excessive use of force against peaceful protests by the Venezuelan authoritarian regime. "The use of state security forces to suppress demonstrations in favor of constitutional rights and democratic principles is absolutely unacceptable and takes us back to the darkest moments in the history of our countries," he added. "We do not want to see martyrs resulting from state-led violence added to the dramatic situation of Venezuela." Almagro urged the political leaders who govern the country to "set aside their repressive attitude, which can only lead to more violations of freedoms and more pain and mourning." He also made reference to the fact that "it is absolutely improper for the military to bend to authoritarianism, its prosecutors are not accusers of political prisoners, its servants are not their torturers, its officers are not instruments of repression, its officers are not the hand of corruption." As Monsignor Oscar Arnulfo Romero said in his most painful homily: "I would like to appeal especially to the men of the army. And in particular, the bases of the National Guard, the police, the barracks ... Brothers, we are part of the same people." "These are words we thought we had learned in the region. However, the greed of Venezuelan government power and its eagerness to hold on to power have terribly divided the people of the country, and ensure that the voice of the Salvadoran hero once again enters the consciences of those of us who believe in democracy, civil liberties and the value and rights of the people," said the secretary general. The OAS leader added that "it is absolutely necessary – under its political, moral and legal obligations – both internally and internationally – that the Venezuelan regime immediately cease all acts of repression by the state security forces and the civilian shock groups that follow the orders of the government in Venezuela in violation of the people's rights." "Today I am obliged to warn the Venezuelan government that the believers in democracy in the hemisphere will not accept payment in Venezuelan blood of the debts of democracy, liberties, prosperity, Constitution and rights that its rulers have put on the shoulders of the people," concluded the OAS secretary general, while making a renewed call for "elections, the only way for Venezuela to have a legitimate government emerging from the only sovereign: the people."